David Friedman is an extremist. If he gets his way, he’ll reverse decades of US policy and encourage apartheid rule over Palestine. Early in his unconventional candidacy, Donald Trump embraced the possibility that he would kick the failed cycle of repeated US-brokered peace talks between the Palestinian Authority and the Israeli government to the curb. In February, he made waves when he told an MSNBC town hall in Charleston, South Carolina, that he wanted to be a “neutral guy” in the Israeli-Palestinian conflict and not pick sides. Trump remained mostly silent about his plans for managing the conflict and the US relationship with Israel, Washington’s largest recipient of military aid, but his slow buildup of hawkishly pro-Israel and anti-Muslim advisers and likely political appointees—including Michael Flynn and John Bolton—hinted that the president-elect wasn’t seeking to stake out a “neutral” position. That came to a head yesterday, with the transition team’s announcement that it would appoint David Friedman, a bankruptcy attorney and Trump adviser, as US ambassador to Israel. Friedman “has been a long-time friend and trusted advisor to me. His strong relationships in Israel will form the foundation of his diplomatic mission and be a tremendous asset to our country as we strengthen the ties with our allies and strive for peace in the Middle East,” Trump said in a statement issued by his team. Friedman immediately announced his intention to seek the relocation of the US embassy from Tel Aviv to Jerusalem, a dramatic reversal of American policy for decades and a move guaranteed to antagonize Palestinians and the Arab world. And his background as a supporter of Jewish settlements in the West Bank sends a strong message that the Trump presidency has little intention of seriously supporting the creation of a Palestinian state. Friedman leads American Friends of Beit El, which collects tax-deductible contributions to support that settlement. Trump’s pick to represent Washington in Israel is president of American Friends of Beit El, a group that collects tax-deductible contributions to support that West Bank settlement. Friedman was seen arguing for the Israeli annexation of the West Bank in a video published by Israel’s Channel 2 in September. 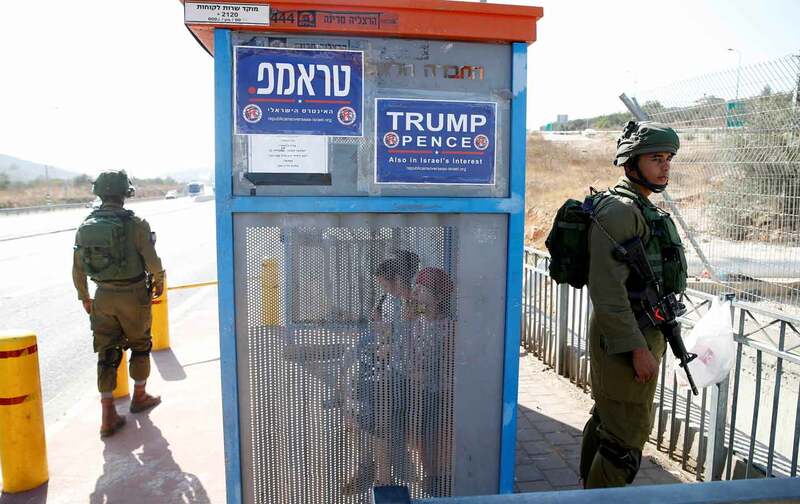 And, in June, Friedman told Haaretz that Trump might abandon the longstanding US support for a two-state solution in favor of a binational state where, in most interpretations of the concept, Palestinian residents of the West Bank and Israel are treated as second-class citizens in what would effectively be an apartheid state. Friedman’s views mark a significant departure from decades of US support for a negotiated solution to the Israeli-Palestinian conflict, but it also puts Trump’s ambassador-designate on a collision course with many Jewish Americans. Friedman has been openly hostile to Jewish liberals, a particularly confrontational position to stake out when 71 percent of Jewish voters cast ballots for Hillary Clinton. David Friedman, the President of the pro-settlement organization American Friends of Beit El, has argued that Trump should back Israel’s annexation of large parts of the West Bank. He’s accused President Obama of being an anti-Semite. And, he’s called J Street “worse than kapos.” If you’re not familiar with that term, Google it. It’s the kind of horrifically offensive rhetoric we’d expect from anonymous trolls online—not from the next Ambassador of the US to Israel. This is a dark time, not only for J Street but for all Jews and Americans who care about Israel’s future as a democratic, Jewish homeland. Friedman may also find himself in conflict with generals and diplomats who have spoken out with increasing frequency about the costs to US security incurred by the ongoing Israeli-Palestinian conflict and the perception that the United States is biased in Israel’s favor. If Friedman gets his way, Mattis might be dealing with the military and security consequences of a US administration that green-lights the annexation of parts of the West Bank and a flood of settlement construction, which could kill once and for all a two-state solution to the conflict. Eli CliftonTwitterEli Clifton is a fellow at The Nation Institute who focuses on money in politics and US foreign policy.